What is dislocation of the shoulder? If you have dislocated your shoulder, your upper arm bone (humerus) has moved out of your shoulder joint. This is the most frequently dislocated major joint of your body. Dislocation is often caused by a significant force that separates your shoulder joint's ball (the top rounded portion of your upper arm bone) from your joint's socket (glenoid). 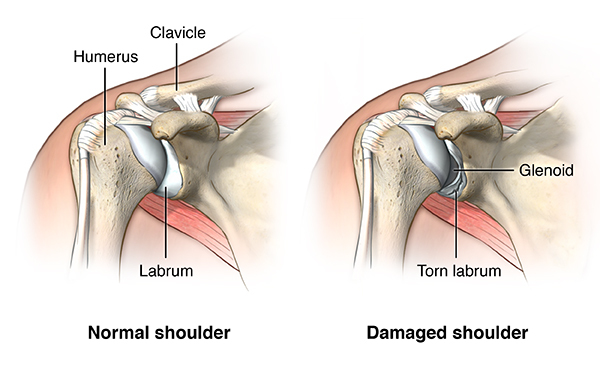 What causes a shoulder dislocation? Forward and downward dislocation. These are the most common types of dislocations. They usually result from falling on your outstretched hand or on your shoulder itself. Backward dislocation. This type of dislocation may be caused by a direct blow to the front of your shoulder, or the violent twisting of your upper arm. Your shoulder can be either partially or completely dislocated. Partial dislocation is when the head of your upper arm is partially out of your shoulder socket. Complete dislocation is when the head of your upper arm is completely out of your shoulder socket. The symptoms of a dislocated shoulder may resemble other conditions or medical problems. Always talk with your healthcare provider for a diagnosis. In addition to a complete medical history and physical exam, diagnostic procedures for a dislocated shoulder usually include an X-ray. How is a shoulder dislocation treated? Can a dislocated shoulder be prevented? Maintaining muscle strength and flexibility can help prevent shoulder dislocations. Once your shoulder is dislocated, physical therapy may help prevent you from dislocating it in the future. Through restoring your shoulder’s range of motion and physical strength, your risk for dislocation decreases. How is a shoulder dislocated managed? Once your shoulder has been placed back into the socket joint, your healthcare provider may advise you to keep your shoulder immobilized in a sling or other device for several weeks after treatment. Resting and applying ice to the affected area several times a day will help your pain and swelling diminish. After your pain and swelling subside, you may need to do some rehabilitation exercises to help restore your shoulder’s range of motion and strengthen your muscles. Dislocation of your shoulder means your upper arm bone (humerus) has come out of your shoulder joint. Your shoulder can dislocate in several ways: forward and downward dislocation, and backward dislocation. A dislocated shoulder is very painful. If you had a dislocated shoulder in the past, you are at greater risk for having it happen again. After you have relieved your initial pain, rehabilitation exercises will help you prevent future dislocation. Maintaining muscle strength and flexibility can help prevent shoulder dislocations.